Brand new in box. We Ship Fast, See our Feedback, and Buy With Confidence! Free economy shipping to lower 48. SEE & SWIM BOUNCER. YOU WILL RECEIVE 1 BOUNCER. DISNEY BABY FINDING NEMO. BRIGHT STARTS. The perfect gift for showers, this gift box includes the Original Jolly Jumper with door clamp and Jolly Jumper Musical Mat - this sure to provide baby with lots of giggles while Jolly Jumping! Fisher Price Rainforest Jumperoo. Baby Bouncer Entertainer. This is an exciting jumper for small ones ages 6-12 months. 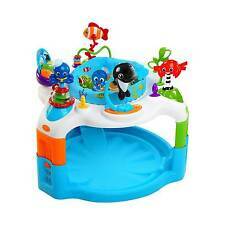 Excellent for playing and bouncing around safely. Giggles come with the first bounce. Baby can jump for hours in this exerciser and the firm back support will keep him/her safe. Has convenient portability, making it easy to take anywhere you and your child go. Maximum weight limit is 28 lbs. 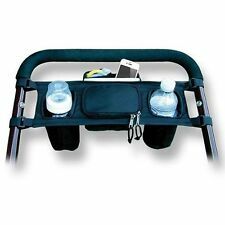 Cradling seat features deluxe faux suede fabric; Toy bar removes with one hand for easy access to baby. 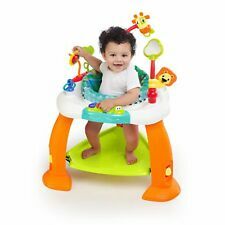 The Sarfari Friends Evenflo Exersaucer jumper rock, spin and jump actions also provide baby with plenty of exercise to strengthen gross motor skills. 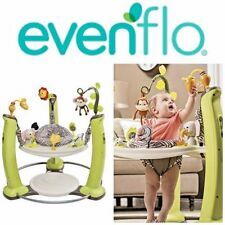 The Evenflo ExerSaucer Jump & Learn stationary jumper is for a child 4 months up to walking age. The Disney Baby Finding Nemo Sea of Activities Jumper includes 13 engaging toys & activities for your little adventurer! Bruce the friendly shark is a ratchet toy with a mouthful of colorful beads. 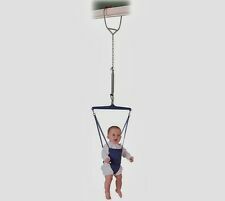 The Original Jolly Jumper with Super Stand from JOLLY JUMPER Jolly Jumper created the 'Original Baby Exerciser' that has been providing fun and physical fitness for babies since 1948. This version combines the best attributes from both of our Jolly Jumper models. Baby Jumpers And Bouncers a space-saving design that easily adjusts to grow with your baby! The Baby Jumpers And Bouncers features an electronic turtle toy station that entertains baby with lights, sounds, music and more! JUMPEROO WOODLAND FRIENDS Design. Fisher Price. Fisher Price Rainforest Jumperoo. There are so many sights and activities to discover on this brightly colored jumperoo—music, lights and exciting sounds reward baby with every jump! Folds for easy storage and portability. Door hanging baby jumper fits in small spaces. Mickey Mouse’s magic makes jumping a dream. Tactile mouse ears that baby will love. And no doorway is required to use this toy, making it a breeze to set it up anywhere. There are so many sights and activities to discover on this brightly colored jumperoo—music, lights and exciting sounds reward baby with every jump! With 360 degrees of multi-sensory activities, your baby can swivel and play every which way. The activity center features 3 play stations and more than 12 activities to explore. The light-up piano lets your baby compose their first musical masterpiece, while the spinning frog bead chaser encourages hand-eye coordination. The Baby Einstein Neptune’s Ocean Discovery Jumper gives your baby 360 degrees of engaging activities with a splash of underwater wonder. There's a crab that spins inside a clear ball, a little starfish that holds a self-discovery mirror, an octopus paddle toy, and flash cards with real underwater imagery to boost vocabulary. Minnie Mouse's adorable bow and ears are 3D crinkle fabric. Padded seat ring ensures baby's comfort. Rock, spin and jump actions also provide baby with plenty of exercise to strengthen gross motor skills. Evenflo has developed a strong reputation as a leading manufacturer of high-quality products for babies and children. Baby Einstein Neighborhood Friends. Activity Jumper 12 Activities. Sealed in Box. 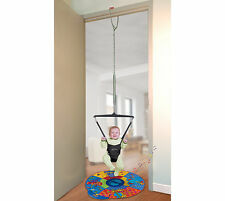 Evenflo ExerSaucer Door Jumper, Bumbly (E1). Condition is New. Shipped with USPS Priority Mail. 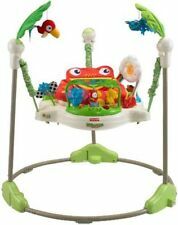 Fisher-Price Rainforest Jumperoo and all its great features! 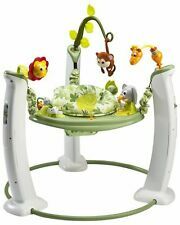 This Fisher-Price Rainforest Jumperoo features a exciting seat and toys at five locations on the platform to engage baby all the way around. Minima order is ONE dozen. 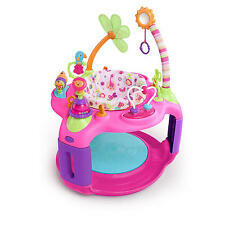 It features a 360-degree rotating seat so baby can sit, swivel and bounce for maximum exploration. Easily folds flat for storage; strap secures folded jumper for travel. 360-degree rotating seat so baby can sit, swivel and bounce. Isn't it just the worst when you lose the most important part to a Baby Product?. Oh no, where did it go?. Features Baby can bounce and discover boundless adventure. 4 toys can be repositioned and rotated. Batteries required: No.